Rev. Kurt Reinhardt is a 1999 graduate of Concordia, St. Catharines. 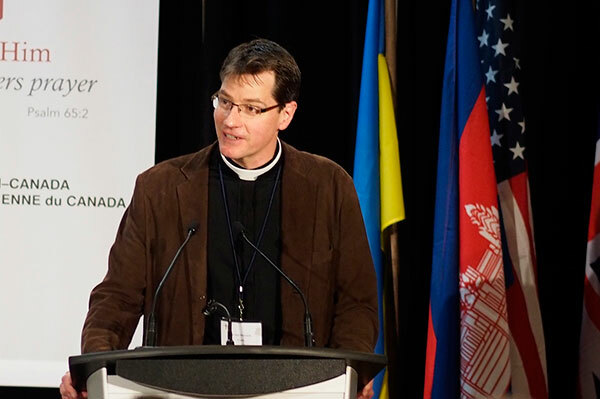 Thanks to the Canadian Lutheran for the story below. Rev. Kurt Reinhardt presents at the 2014 National Convention. (Photo: Gabor Gasztonyi). VANCOUVER – Saturday saw Rev. Kurt Reinhardt take the stage for the first part of his keynote lecture “Come to Him Who Answers Prayer – As Dear Children Ask their Dear Father.” In it, Rev. Reinhardt noted that God’s family is meant to be a speaking family. We were created to be in conversation, with God and with each other. But in sin, humanity stepped away from the conversation. Yet God in love restarts the conversation. He reintroduced Himself to man. That reintroduction begins with the Prophets, but it finds its ultimate manifestation in His Son. And the Son came that we might believe that God is our loving Father—bringing us back into God’s Family through baptism. As He does so, He helps us relearn to speak—to relearn how to be in conversation with Him. We learn to speak as we are spoken to—our prayers are formed by God speaking to us. Filled by our own importance, we fail to listen to God, effectively ending the conversation. We must first listen to God before we try to pray, Rev. Reinhardt explained. He wants to speak to us, but we must let Him lead the conversation. From that foundation, we learn to speak together as God’s Family. Christian prayer is always family prayer, praying for one another that we may be one as God is one. And we pray together not because more people are somehow better able to convince God to do what we want: He heard Elijah even though he was all alone. Instead, we pray for others when they ask us because through this God is calling us into His work. God calls us to pray together so that we can pray with one voice. Rev. Reinhardt will return Monday to continue his essay. Following the convention, video of his presentation and the text of his speech will be made available online.